If you're new to RuneScape, you'll probably want to know what to start off with, such as which skills to train or which quests you should work on first. This guide will explain a bit about each skill and explain which quests you should do first. Now you would probably want to start off with a weapon that can kill anything in one shot. That's not going to happen, but the next best thing is a Scimitar or Battle Axe. Each time you are able to wield a new metal type of weapon, go for the next type of Battle Axe or Scimitar. If you are willing to take a risk and sacrifice some Defence to cause some major hurt, try a 2-Handed Sword. They are slow and you won't be able to use shields. Also, try to level up Smithing, as you might be a good enough smithy to make your own weapons and armour. Try shops such as the axe shop in Port Sarim, or the sword shop in Varrock. Start by getting around 100-200gp. Then go to the Ranging shop in Varrock and buy a normal Shortbow. Spend the rest on Bronze Arrows. Make your way south of Varrock to the small farm with a shed and plenty of chickens and continuously pummel the chickens with arrows. Be sure to pick up any that fall on the ground after impact. It is optional to buy some leather armour to start off with, but it's not the greatest idea when sniping chickens. Put everything in the bank and switch to a world (server) that has a small amount of people and head to Varrock. Using your map, head into the Wilderness and head to the chaos temple surrounded by lava. When I went, there was no one around. There are around 20-30 continuous bone spawns, which will provide a fair amount of Prayer experience when buried. Magic can be expensive to start with, but when combined with Runecrafting (see below), it should be ok. Head to the Wizard's Tower south of Draynor Village. If there are some wizard's robes that are already on the floor, grab them. If not, leave, or kill one (don't wear metal-related armor!) and grab some blue robes. If you have completed the Rune Mysteries Quest, grab a pickaxe, go mine some Rune Essence, and obtain mind and air talismans. Then craft some mind and air runes. If not, buy them from the Varrock magic store. Cast wind strike as much as preferred on rats in varrock sewers. You must have completed the Rune Mysteries Quest before starting this skill. Go to Varrock with a pickaxe, head to the magic store and ask to be teleported by the shop owner to be teleported to the Rune Essence. Mine 28, head out, bank it, then repeat until you have around 200-300. Head to Falador bank and buy a mind talisman and an air talisman off another player for a reasonable price. Halve your rune essence that you mined and write that down. Keep taking 28 essence at a time to the air temple south of falador and craft air runes. Then repeat this with the other half of essence except this time do it at the mind temple, north of goblin village. Recommended to use these for magic. Unarmored, go to the Tree Gnome Stronghold and do the Gnome Agility course. There's not much else to do until level 35 agility, when you can start training (once you've done the Barcrawl) at the Barbarian Outpost agility course. Of course, Skullball and Gnomeball are always open! Note: Agility is a Members-Only skill. To start herblore, you need to have finished the Druidic Ritual Quest. If you're strong enough, kill unicorns, as they most likely will drop unicorn's horns. Go to a general store or a Herblore store and buy some vials. By some marrentil from another player, unless you have your own. Fill them all up with water and then combine then with crushed unicorn's horn, obtained by using a pestle and mortar with a unicorn's horn. There you have it, an antipoison potion. These give herblore exp, and are also useful in combat vs poisonous monsters. Note: Herblore is a Members-Only skill. To start, there are quite a lot of easy quests that could get you well on your way to master thievery.See the Quest Experience Guide for more info. Pickpocketing is the way to go until you reach level 5, from then on steal from baker's stalls, found in the East Ardougne market area. After about 10 minutes you should have at least 100 cakes, useful for healing in combat. Continued this for a while. Though I completed a few quests to get to 25 thieving quite easily, mind you. Note: Thieving is a Members-Only skill. Pottery is the easiest and possibly most effective way of obtaining that valuable crafting experience. Get a pickaxe, go south of varrock, and start mining clay. Get 1 bucket, fill it up, and use it with the clay. Get 28 ready clay and head to Barbarian Village. Spin pots on the pottery wheel and repeat as many times as you wish. Start making better pottery when you reach the required level. The good thing about fletching is that you gain woodcutting exp whilst fletching. Grab an axe and a knife and go cut down 28 regular trees or evergreens. Cut them using the knife into arrow shafts until level 10 fletching, then cut them into bows. String the bows if you wish and use 1 of them for ranged combat if desired. Fletching can be a valuable skill. Note: Fletching is a Members-Only skill. 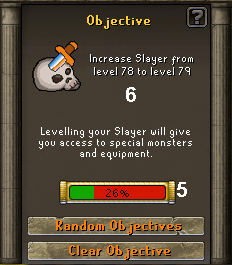 Head to Burthorpe's Slayer master, as he gives easy assignments. He should give you an easy one, like goblins or something. If he asks you to kill dogs, you may be in a spot of trouble, as the lowest level dogs, I think, are level 44. Tag a friend along if this problem occurs, for help. Always use protection, like a spiny helmet. Note: Slayer is a Members-Only skill. Mining is easy to start off with. Mine 28 tin and bank them. Mine 28 copper and bank those too. Repeat this as many times as wished, then head to Falador (or another place with a furnace) and smith bronze bars. Then mine again, and again, and again. Mining exp goes up fairly quickly, and when you can mine coal you can sell it for good money. Well it's fairly obvious to start with bronze. Make sure to have a hammer to use at the anvils. I suggest completing Doric's Quest for quick access from Falador to the anvils. You should also keep the first set of bronze that you make for yourself for fighting in combat. Start by fishing Shrimp using a net. I started using a rod as soon as i had the required level, but if you can't afford the bait, keep netting shrimps. Fish are good to cook and good to eat and can sell for good cash to fishy friends and baiting buyers. Chickens and Shrimps provide the same amount of early experience, but its your choice: if you want combat exp, kill chickens and cook the raw chicken, and if you want fishing exp, catch shrimp and cook them. Cooking is a good skill because it provides the opportunity to cook foods that can heal lost Life Points. Cut logs and burn them until you can cut the next best type of tree, then burn them. But wait... when you get to cutting magic logs (which will take a while, trust me!) don't burn them; sell them! They can sell for 1,000gp (1k) each. This is even more self explanatory than firemaking. Because all you can use woodcutting for is, well, woodcutting. Sell Yews and Magic logs when you have the ability to cut them. Otherwise, burn or fletch all other cut logs. There are quite a few quests in RuneScape, but there are a few that you should work on when you first start out in RuneScape, as they give some decent rewards such as cash or experience, which are both essential when you're a beginner. Try the Prince Ali Rescue Quest. It's a bit long, but it gives a decent reward. First try the Demon Slayer Quest - save the world from the evil Delrith! 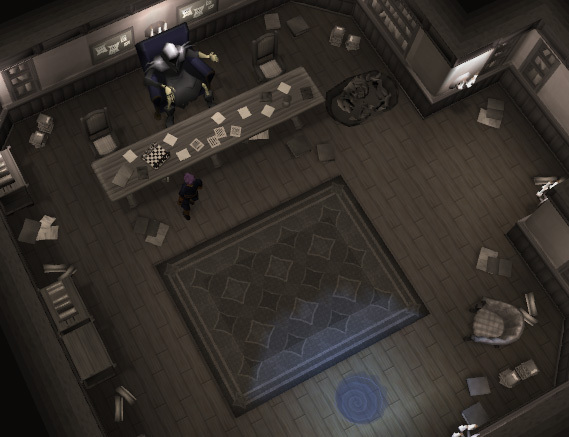 Then try out the Vampire Slayer Quest to rid Draynor of an evil vampire. Try your hand at the Witches Potion Quest. And collect some beads during the Imp Catcher Quest too. And of course, don't forget the Rune Mysteries Quest to have access to Runecrafting. Try finding the Pirate's Treasure for a good reward. Bring a friend with you to complete the Shield of Arrav Quest. Cooks - help the Lumbridge Castle Chef with the Cook's Assistant Quest. Miners - help Doric with his ore supply in Doric's Quest. Smithers - save the Squire's career in the Knight's Sword Quest. The Objective System was introduced in order to help training your skills and completing quests more organized. It works as kind of a skill focus, allowing you to see exactly how far you are to your goal. This feature was made mostly for newcomers who are a bit fascinated by the amount of things that you can do in-game, and offers them a more organized way of training their skills. However, due to how helpful the Objective System actually is, this feature is great for players of any level! 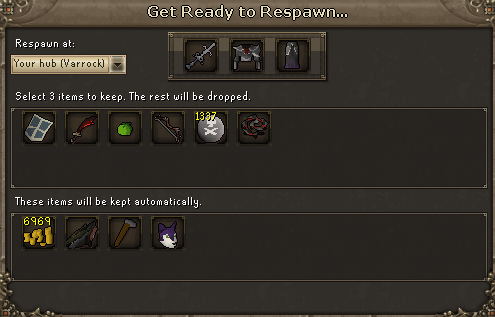 To start, just click the little arrow icon at the bottom left of your inventory interface. This displays your objective after you have chosen it. Clicking this will clear the objective that you've put in. 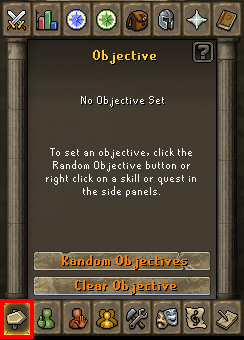 When you click this, you will be taken to a screen which will allow you to click on any objectives that the game thinks might be useful for you to have. It is a bit more strict than the right click on the skill icon option because the random objective button will only track how much experience you need for the next level. The little question mark at the top of the interface is for contact with the advisor. You will learn more about him later on in the guide. This tells you how far you are until you reach your goal. This starts counting experience from when you start tracking your goal, not in terms of experience from when you've just gained your last level. This is basically a description panel that will come up in the center of the interface after you've set your objective. It shows the skill icon, what your goal is, and whether or not you will unlock something upon completion. Since this is a feature aimed mostly at new players and like most updates, the best way to learn is by playing around with it while reading a guide. Oh, right. This is a guide, so you have one! You now know the features, now time to find out how they work. There are two ways to set an objective. You can select from the "Random Objective" panel, or you can right click on a skill icon and select "Set Objective". After you have selected your objective via the skill menu, you will have to enter your desired level. Just hit enter after, and you're done! You can do the same for quests. 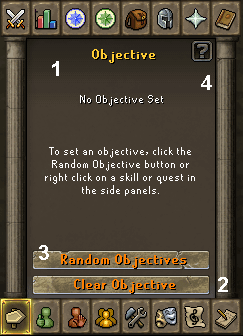 Right click on a quest that you have not yet started, and select "Set Objective". You cannot set a completed quest as an objective. 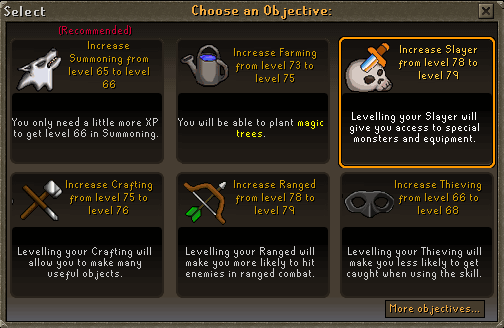 Sadly, you are not able to set a skill that you have already gotten 99 in as an objective. This may or may not be changed in the future. If it is changed at all, you will most likely be able to type in the amount of experience that you desire in that particular skill. To clear your objective, simply click "Clear Objective". When you log out, your objective and experience percentage will not be lost. The experience percentage starts counting from when you first set the item as the objective. 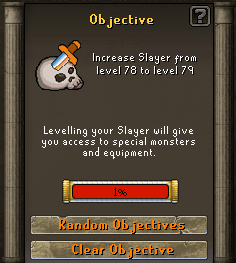 Lets say you have 10,000 experience to get 79 Slayer for example, it will start at 0% when you first put it as your objective. When you clear it, it will reset back to 0% the next time you set it as your objective. The Advisor, or Roddeck, is a helpful NPC who you can talk to by clicking the question mark located at the top right part of your objectives panel. It is marked on the interface feature map shown earlier. This part is probably mostly for newer members. When you click it, you will be given a box like this. From there, you will be given options to ask questions based on what is in your inventory. 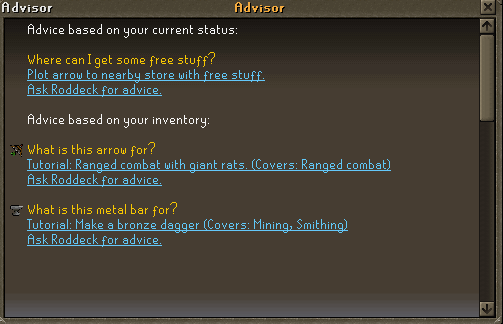 You can access the advisor via the Objectives interface or by clicking the other question mark located at the top right of your screen next to the Log-out button. Do you have a few tidbits of information that you'd like to have access to in game easily? 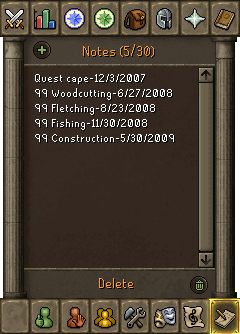 Well delete it off your ignore list because as of July 8th, 2009, all players can now use the "Notes" feature. It is a very great way to keep yourself organized while playing. This feature can be accessed by clicking on the icon on the bottom side of your inventory interface. You can store any bit of information that you'd like in your notebook. Whether it be goals, achievement dates, a merchanting item you've been watching, or even events. In your notebook, you may only have a maximum of 30 notes each with a maximum of 50 characters. The maximum amount of characters would be 1500. To write a note, click "Add" at the top left corner of the interface. To delete it, either right click and select delete, or highlight it and click "Delete" at the bottom right corner. It is also possible to customize the colors of your notes. This is helpful to organize unfinished notes, notes not yet started, or achieved notes. You can do this by right clicking a note to highlight it, and then selecting "Color". If you want to edit your note, simply highlight it and select edit. As a tip for security reasons, DO NOT store your bank pin, password, or recovery questions in your notes. 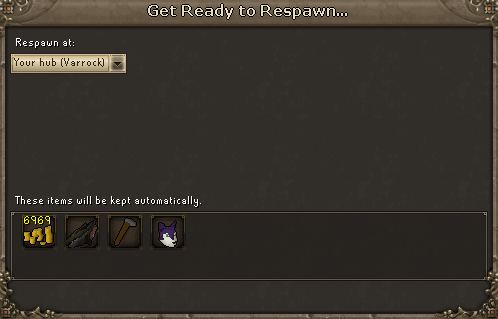 Jagex has also put in a few little Easter eggs for you to find when you type in certain messages. They are mostly references to movie lines or Internet jokes. Players are still finding more but here are just a few. "All your base are belong to us" -> "Orly??" "Redrum" or "Murder" -> "All rest and no play makes Guthix a dull boy." "Paul" -> "Rargh, I'm a lava monster!" "I am your father" -> "Nooooooooooooo!" "There is no spoon" -> "Then you will see, it is not the spoon that bends, it is only yourself." "You fight like a dairy farmer" -> "How appropriate. You fight like a cow." Dying isn't such a big deal in Runescape, but the first time for everything is always very special. And the best person to talk you through your first time is none other than the grim reaper. Upon death you'll be whisked away to Grim's Realm. He'll then beckon you over for a little chat. Certain major towns are designated as 'hubs'. After you've died, you will usually respawn, fit and healthy, in the last hub that you visited. In certain circumstances you may find you have an alternate choice. 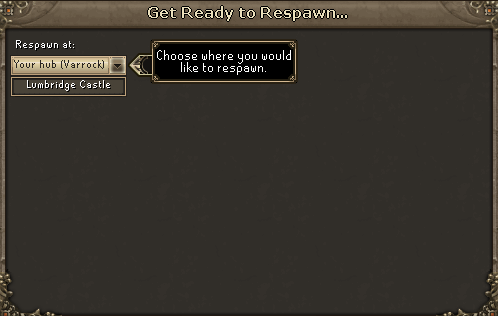 The drop-down box shows the places you may choose to respawn in. As you complete quests, you may unlock more respawn locations. A gravestone marks where you died. Gravestones are fragile, and will eventually collapse unless other people maintain them. You must make your choices before your gravestone crumbles, so don't dawdle! A timer shows how much longer you've got before your gravestone collapses. As you complete more quests, you may be able to upgrade your gravestone to more durable models. The timer appears just below your minimap. To see where you died, open the world map once you respawn and you will see a marker indicating your gravestone's location. The marker will look like this. If you died in a dungeon, the map will automatically open to that location, showing you where your gravestone is. Although you will always recover from death, some of your possessions may become lost. Provided you're not in a region of particular peril, such as the Wilderness, certain items will always remain with you. This section shows items that you will always keep when you die. The list includes things like coins, basic combat kit, fancy costumes and various items that are only used during quests. Other items may be lost to you when you die. These typically fall to the ground when you die, and you can retrieve them if you get to your gravestone before it collapses. You may protect 3 of these items, rather than dropping them, if you are not currently under any special penalty. Remember that the world map can be used to navigate to your gravestone, where you should find your dropped items. The next picture shows items that are not protected and may drop when you die. You can choose which items you want to protect. The most valuable items are selected by default, but the choice is ultimately yours. Also, a prayer can be unlocked (at lvl 25 pray) that lets you protect one additional item when you die. Once you've finished choosing, you're ready to respawn. When you've made your choices, press the 'Confirm' button. If you dismiss the menu by clicking outside of it, you'll be respawned immediately, so try not to mess about. If you want to go through that again then just click on him to talk. If not head out the blue pulsating portal to be respawned for the first time!